Dilling Group Hosts 2018 SkillsUSA Welding… | Dilling Group, Inc.
Dilling Group Inc. (DGI) was proud to host the 2018 Tennessee SkillsUSA Welding Competition at our Charleston TN Fabrication Shop. There were 34 students (24 High School students and 10 Community College Students) from across the state of Tennessee participating in this 2-day event. SkillsUSA’s mission is to empower its members to become world-class workers, leaders, and responsible American citizens. The focus of the contest was to evaluate each student’s preparation for employment and to recognize outstanding students for excellence and professionalism in the field of welding. 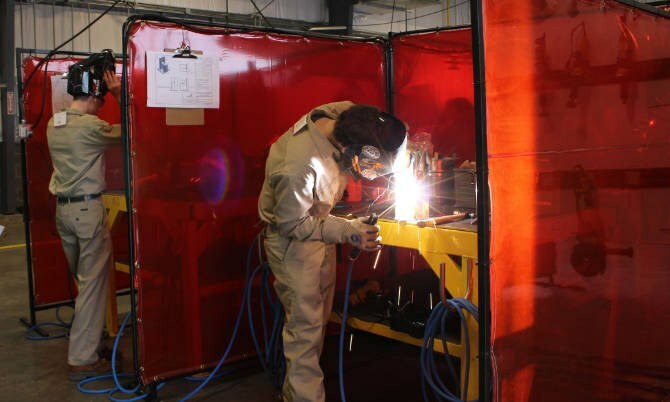 There were 5 tests administered to determine their skill and knowledge which included: A carbon weld test, a stainless weld test, a torch test, a written test and a mock interview. After the vigorous tests, there were 6 total winners (3 from each division). The presentation ceremony was held on Wednesday, March 21, 2018 at the Chattanooga Convention Center with 2200 contestants and 300 instructors and volunteers in attendance. In addition to postponing shop production for the 2 day event, the Dilling Group team provided five judges: Casey Ott, Chris Walker, Mike Harlan, Stephanie Laug, Amy Payne, with two additional volunteer judges: Wayne Blamire and JD McCann. Sponsoring partners in our effort include: Airgas, Red-D-Arc and United Rentals. Some employers that came to speak with the students were: Wacker Polysilicon and Nokian Tyre. We look forward to participating in this exciting event next year – April 1-3, 2019. Dilling Group Inc is a family owned industrial contractor headquartered in Indiana with multiple regional offices in Indiana, Kentucky, Tennessee and Louisiana. Celebrating 70 years of experience, DGI has a long history of investing in the recruitment and training of young people in the skilled trades and this is just one example of our commitment to a strong and well-trained workforce. For more information about the Dilling Group, please visit our website at www.dillinggroup.com.